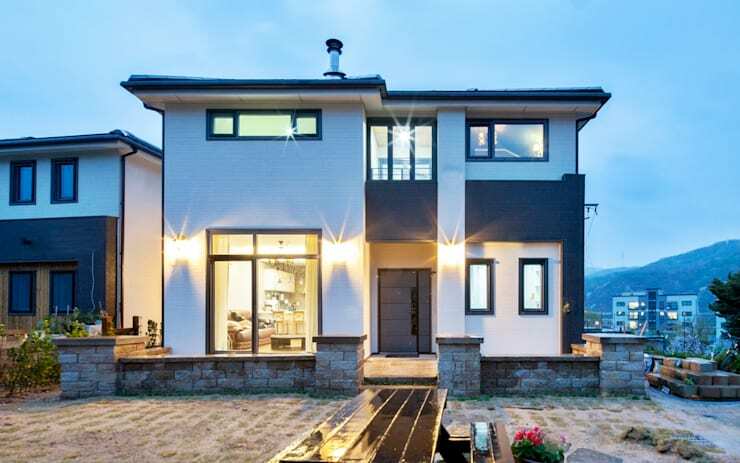 This modern Asian home has a streamlined modern feel and timeless appeal. 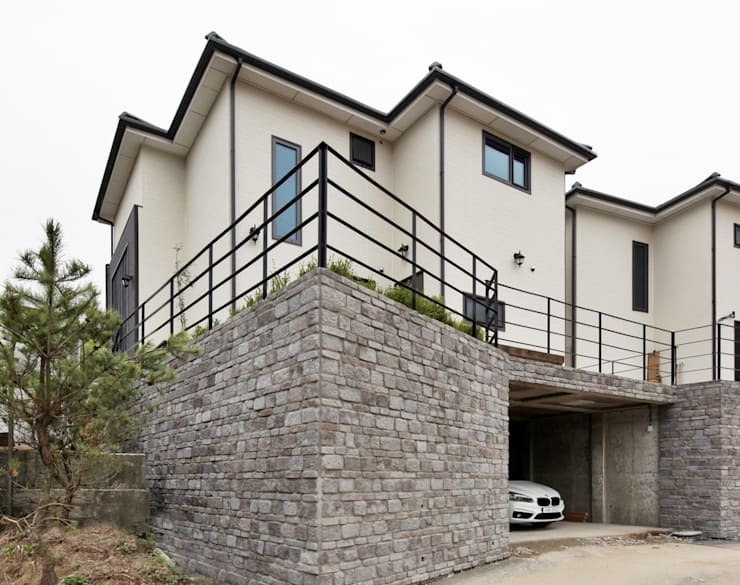 It was built in the Korean countryside and the entire house has been designed to make the most of the views. But it's the small, classic elements that really make it feel like a family home. The two-level home has a simple, elegant facade. The area is semi-rural, so the windows are large to take in the natural surroundings. There is little, if any, ornamentation and the colour palette is almost completely monochrome. The simple, almost Zen-like ambience of the house is accentuated by the use of natural stone and wood. The steep incline of the site has been utilised to create a great underground garage with parking for two. The roof of this garage has been turned into an outdoor deck that promises lovely views of the semi-rural surroundings. Also, note the fine black railing used here. Lightweight structures like this help eliminate the potential visual weight of such a design. The interior has a refreshing mixture of modern and classic elements. The streamlined windows and recessed ceiling are clearly modern. But the lighting fixtures, fireplace, clock and cabinetry have been used to add a more classic touch. Older-style features like this are great in a family home. They add a sense of history and timeless appeal. The hardwood floors seen here are, of course, another big part of this look. The white kitchen has lots of great storage space. The bright cupboards have decorative wooden doors that give the home and older-style appeal. It almost evokes the ambience of a country kitchen. 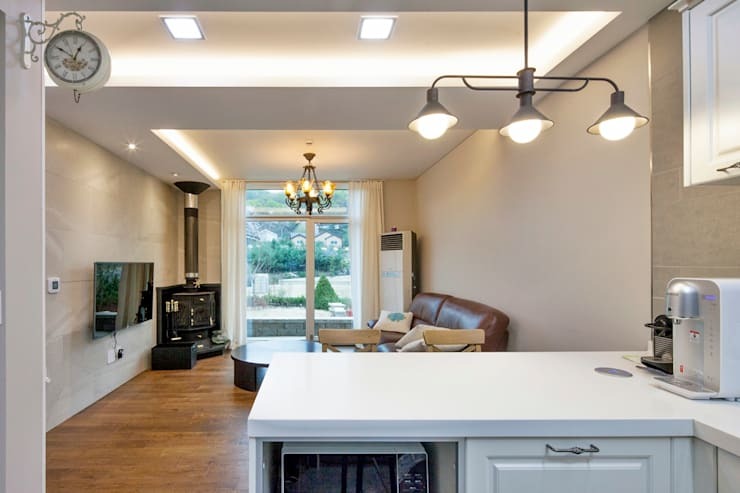 Nevertheless, the white and grey palette gives the kitchen a simple, understated look. This perfectly straddles the two influences in this home. 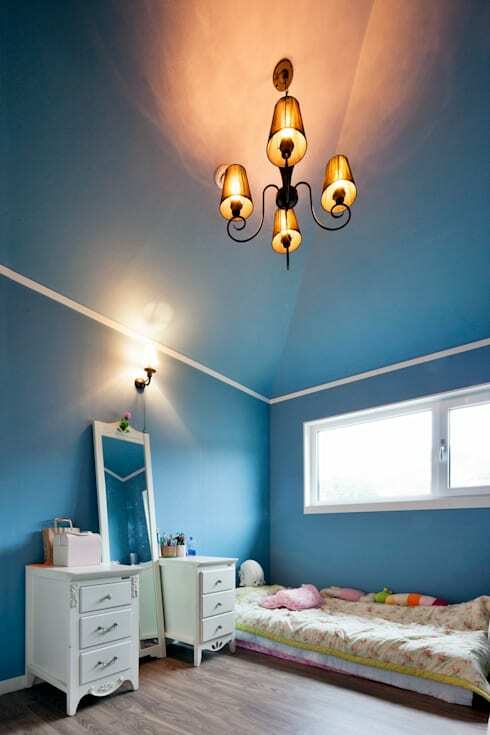 The child's bedroom here has been painted a bright powder blue. It also has a rather lavish full-length mirror and an antique European-style dresser. So it's surprising to see the simple mattress placed on the floor. This gives the bedroom a uniquely Asian feel that somehow manages to work within this otherwise European decor. The master bedroom is painted a fresh apple green and has a separate walk-in closet. The bedroom feels very different from the other rooms we have explored today, but the classic doorways really serve to link the various colour palettes used in this home. The doors are painted an antique blue-grey tone and have a fine series of ornamental edges. This is certainly a home that fuses two styles of architecture and design together! For more family home inspiration, check out A family home of form and function. Do you like the subtle combination of influences in this modern Asian home? Let us know in the comments field below!